One of the most important things you can do when setting up your blog is to get your RSS feed set up with a web feed management provider. Making it easy for your readers to get updates of your new posts is essential. If you have a website in addition to your blog, then let's take it a step further. If your website and blog work together then you should feature your blog on your website. In this tutorial you will learn how to set up a blog feed on your website using Feedburner. RSS stands for "Really Simple Syndication" and is basically just a way for people to subscribe to your site and get notification each time there is new content on your site. Feeds are a way for websites to distribute their content beyond relying on visitors to come across their sites using search engine browsers. Feeds allow readers to subscribe to regular updates, delivered automatically via a web portal, news reader, or email. Feeds also package site content into "widgets," "gadgets," mobile devices, and other bite-sized technologies that can be displayed anywhere - blogs, podcasts, etc. If you have a website, blog, audio/video content, or even photos, you can offer a feed of your content as an option. If you are using a popular blogging platform or publishing tool like TypePad, Wordpress, or Blogger, you likely publish a feed already. There are also tools on the market that can help transform traditional web content into the right format for feed distribution. For the reader, you can keep track of a large number of your favorite websites or blogs without having to remember to check each site manually, or cluttering your email inbox. For the publisher, feeds permit instant distribution of content and the ability to make it "subscribable." Most blog sites already have an RSS feed set up and ready to go. Feedburner is a service provided by Google that includes many additional useful features to your RSS feed. 1. Go to http://feedburner.com. If you already have a Google account, you can log in with your Google credentials. If you already have Feedburner activated, skip to step 4. 2. Type in your site or existing feed url to activate your Feedburner feed. 3. Next, type in a memorable and simple title and url for your feed. 4. Click on your blog link to open your dashboard. Now you can customize the appearance and activate extra features on your feed. 5. Click on the Publicize tab. 7. Customize the feed settings including how many post items to display, if you want to include a feed title, the publication date, etc. 8. Activate/save your settings and copy the code snippet. 9. On your html page, paste the code snippet where you'd like it to be displayed on your web page. 10. 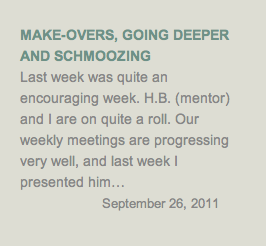 You may want to change the appearance of your BuzzBoost feed to match the style on your web site. That's it! 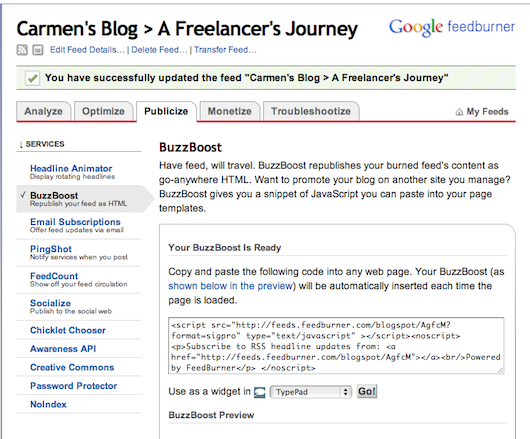 Now those who visit your site can click on the blog feed excerpt and go directly to your blog to read more. Can Pro Bono Work, Work for You?